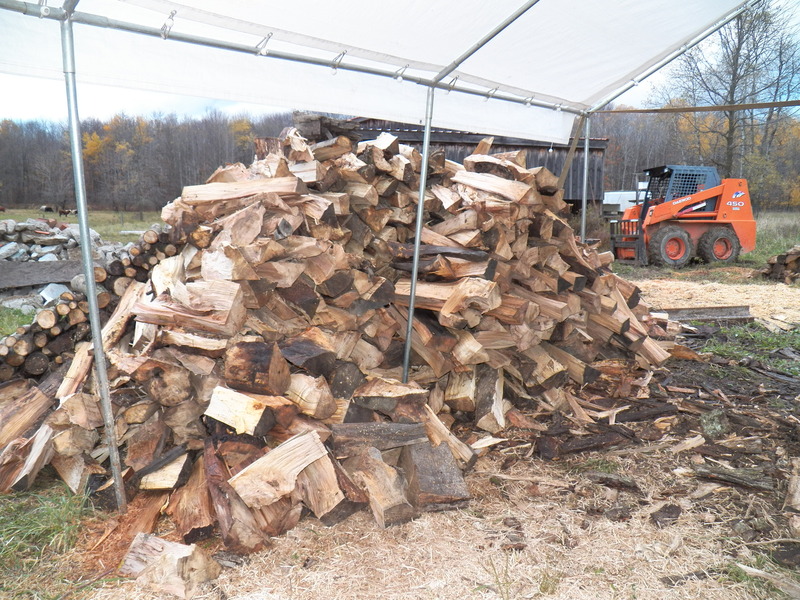 Today, my Amish friends and their sons showed up to help me reduce a pile of logs to sugarwood. We went at it for two hours. The 10×20 tent provided just enough protection from the rain to make it a great job. We stayed mostly dry. The skid steer brought logs to the tent. Then men with chainsaws cut them to length quickly. Three men on the log splitter made the pieces fly. Five little boys stacked wood like professionals and this job was behind us in record time. The rain slowed to a misty drizzle after lunch. We decided to buck up a giant tree into logs. The tree blew down a year ago. The horses and I will pull the wood out. We made over twenty logs from the giant limbs. The trunk is still almost five feet across on the small end. The tree has a base measurement of over twelve feet in diameter. The hulking trunk log is mostly hollow, but will take me many hours to reduce it to firewood. Today, I was reminded of just how a sense of community is a wonderful thing. Friendship is power beyond any ability. We had fun. We worked hard. We accomplished much. I am ahead of my own schedule and all because we trade labor. I worked at different times this summer for my friends. I took machinery and tools along with my knowledge. We finished a few projects at their place…and today it came full circle. I am not only amazed at what a bunch of guys can do… I am humbled!